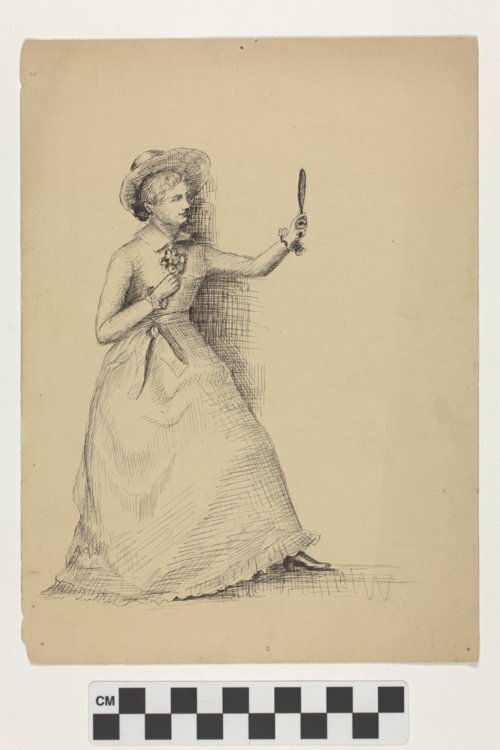 Drawing by Myron A. Waterman (1855-1937) of a woman holding a mirror, presumably his second wife Alice Gertrude Sheldon (1862-1925). "AGS" monogram in pencil in lower left corner of her skirt. Myron Waterman first gained recognition in the latter part of the 19th century when he established and edited the Fort Scott Lantern. He held a number of other occupations throughout his life including working in the drug store business and serving as a deputy state bank commissioner of Kansas from 1894 to 1901. Waterman was a staunch prohibitionist and a member of the First Congregational Church in Topeka, Kansas. Alice Sheldon was the sister of Reverend Charles M. Sheldon (1857-1946), who led the congregation. She and Myron were married in 1897.